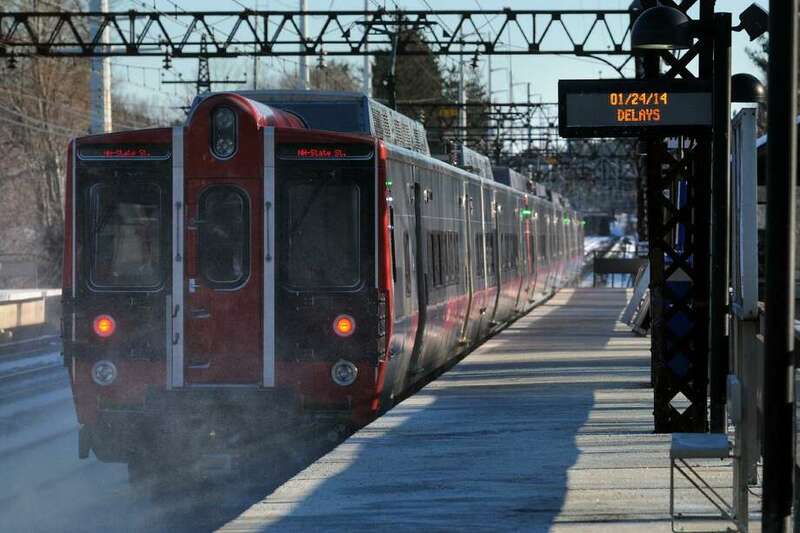 A New Haven bound Metro-North train travels through Greens Farms station, in Westport, Conn. Jan. 24, 2014. WESTPORT — The town has six years to submit a legal challenge to the Federal Railroad Administration’s plans to expand the Greens Farms Train Station according to First Selectman Jim Marpe. The Federal Railroad Administration approved a “modified” Greens Farms station in July in its Northeast Corridor Reason of Decision outlining the Northeast Corridor rail plan. The NEC project, which would connect Washington, D.C., to Boston with high-speed train infrastructure, plans to expand the Greens Farms train station in an effort to equip the station to serve as a transfer point along the rail-line. “I have been very concerned about the development of this plan and its consequences for Westport. I have been meeting with elected leaders from Fairfield County and representatives from Sen. (Richard) Blumenthal’s office in an effort to coordinate a strong and united approach that we can take to the Federal Railroad Administration regarding our concerns,” Marpe said. Following up on his concerns, Marpe requested Town Attorney Ira Bloom of the law firm Berchem Moses PC of Milford review the statute of limitations for appealing the ROD. In turn, Bloom reached out to the law firm Aikin Gump, which is knowledgeable in matters concerning federal regulation. Gump researched the issue and recently announced the opinion that legal challenge to the ROD must be filed within six years, which is a statute of limitations much longer than the previously assumed Dec. 7, 2017 appeal deadline based on the 150 days from the ROD Federal Record listing. Nonetheless, Bloom said he and Marpe hope to move forward in challenging the station plan. “He wants to move on this. We want to get some sort of clarification as to this suggestion that Greens Farms might be appropriate for an expanded station,” Bloom said. Marpe expressed similar sentiments as Bloom. “This gives the the town ample time to continue to negotiate with the Federal Railroad Administration, but it is certainly not an invitation to let the issue take a back seat. We are committed to getting the FRA to remove any reference to a modified Greens Farms Station and engage them on focusing on achieving a “state of good repairs” for the Northeast Corridor,” Marpe said. In addition to improving Amtrak’s Northeast Corridor, Marpe called for Government investment in the Metro-North system to increase train speeds from Westport to New York City. District 5 Representative Town Meeting member Greg Kraut, who represents Greens Farms, said he’s pleased by the increased timeline for challenging the modified station. “The Greens Farms trains station is iconic and in my opinion needs to be preserved,” Kraut said. Similar to Marpe, Kraut wants to turn focus to quickening the commute to NYC. “I am all for a faster and safer commute time to NYC, since I am a frequent user. There are a significant amount of residents who relocate from NYC and it’s also one of the main reasons why people don’t move here,” Kraut said.